This entry was posted in Uncategorized and tagged game, history, interactive fiction, mainframe, mainframe computer, non-deterministic fantasy stories, Peter Langston, text adventure, text adventure game, Wander. Bookmark the permalink. 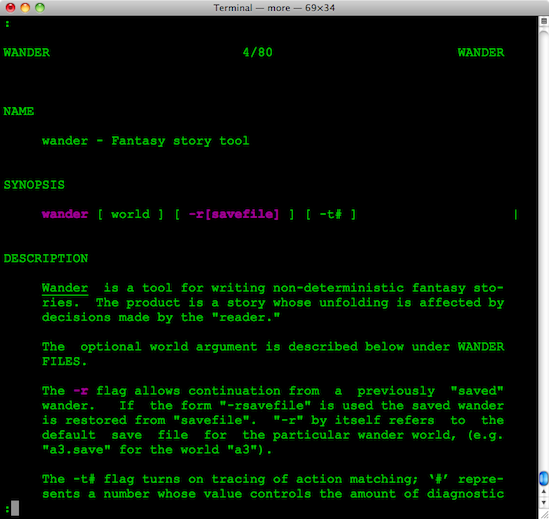 60 Responses to Wander (1974) — a lost mainframe game is found! Can you share the .tgz? +1. Send it to Internet Archive! Also, put it on GitHub, so all ports, fixes, etc. have a common place for collaboration (via the main repository or via forks). Another +1 for posting to GitHub. Please? See UPDATE 1, in my post, above. could you release your patch and OSX version? i’d love to be able to get this working on my Mac as well? I wonder if you could create a chat interface where a ‘player’ and ‘dungeon master’ have their interactions recorded and used to build a replayable text game up automatically. Please be patient; Peter just recently unearthed this ancient C port and has been having to find moments in his spare time to get it to work. I should add that a3, the game excerpted above, is (by his recollection) from 1977-1978, made during a period where he was fixing up the source code to make it easier to understand, but there are games that date back to 1974. However, those games are buried on a tape which may or may not be readable. Oh, and I should add, if anyone has access to something called a “PSL Games Collection” that as distributed for UNIX around the mid-80s, that would have everything. Contact us! While I appreciate the work to get it running again, I’m also concerned that changes may be being made to the original code. Researchers studying the code, if/when it’s released, won’t be able to say with 100% certainty that something was in the original or not. I’d argue for releasing the original – if broken – version separately. I agree. I think it would benefit everyone if a history of code changes was kept through revision control. I would very much like to see the current project placed up on GitHub with future changes being tracked through there. Furthermore, it would allow others the chance to look at the code and help make changes. This is something that I would be personally interested in doing. This is exactly the strength of a tool like git / site like github. You can release the original code in exactly the shape you found it and have a completely history of every micro change that was made to it and why. Further, others can fork it and move it in their own direction, while never losing the traceability back to the original. Of course, the license of the original code should be respected while doing this. This kind of computer archaeology Is only going to become more important. We should act like Sir William Flinders Petrie did and turn this archaeology into a true discipline. To note what might be the obvious, this is based on Poul Anderson’s Flandry of Terra novels. Ok folks, the floodgates are open. Beautiful, thanks! I threw it up on Github. I’d like to parse out the wander.nr and make a proper man page that’s displayed in a markdown README. I wanted to leave the two READ_ME and READ_ME_TOO intact. I have just added an easier-to-compile version to that post. The binary-hybrid compiler is all we’ve got of 1980, sorry. It’s the only one that has all the worlds, though. If more gets unearthed, we’ll let you know. In the meantime you can compile with the 1984 version. Thank you for the article! It inspired me to write my own notes (http://ifhub.ru/blog/198.html in Russian) about this great game tool! It would be very interesting to know where Peter Langston got this idea about using of pattern matching. The syntax slightly resembles META II system (http://en.wikipedia.org/wiki/META_II ). Thanks for the comment, and the notes! I think it would also be very interesting to know where Peter got the whole idea to create Wander in the first place, especially because his very first version seems to have been so early. But it’s hard to remember that far back, so this may remain a mystery. Could you expand on what you mean by “pattern matching”? You probably understand the code better than I do! Pattern matching is a high-level feature for parsing structured data. It can easily replace a complicated code that use a lot of conditional branching. In each location inside .wrld file we see a set of rules. Wander (it’s a simplified description) will try to match each rule, from first to the last, with the user input, until the first success. Each rule consists of some fields and uses two syntax constructs: sequence (field1 field2 …) and alternative (field1 | field2 | …). Let’s take an example from a3, first location. Here we have 4 rules. Wander will evaluate them as shown below. 1. If user input is “south”, go to location #2. 2. Else if user input is “west” goto location #200. 3. Else if user input is “north” or “east” or “ne” or “nw” or “se” or “sw”, show the message text. 4. Else if user input is “take card” and the card is here (either being carried or in location), the card is now being carried (this field will always return success, there is no conditions here, only changing of the state), show the message text. As you may see it’s easier to describe things in this manner instead of using lots of nested if/else constructs. Hi! I just took over as editor of SPAG, a long-running web magazine about interactive fiction, and I’d love to interview you for our next issue (tentatively running this summer and/or fall). If you’re interested, let me know! I couldn’t find an email address on the site so I’m commenting here. Thanks! Thanks, Katherine. I’ve emailed you. I’d like to mention you (and Jason) by name in a history speech I’m giving this weekend. If you’re comfortable with this, can you email it to me? Thanks! Pingback: Le origini delle avventure testuali rimesse in discussione? OMG You have the most obnoxious ads imaginable Loud and looping indefinitely. They keep restarting even when paused or unmute after being muted ! I’m sorry about the ads. I don’t have any control over them, and nor do I get any money from them! They’re placed here by WordPress. At at guess the call to wopen needs to include a ‘b’ in the flags to work properly on DOS as otherwise it won’t be binary transparent due to CR->CRLF mapping issues. This is an awesome find. Reading this post was a sort of nostalgic moment for me, because my first PC game was a Text Adventure called “Haunt” on my MS-DOS 286 PC that boasted no sound card and a text-only monochrome monitor. Before that PC, I’d only played console games so I’d never come across that genre. Found it fascinating at the time because there was something atmospheric to only seeing rooms through my mind’s eye.